Our traditional pole marquees evoke the romance and a classic timeless quality that many people associate with events under canvas. 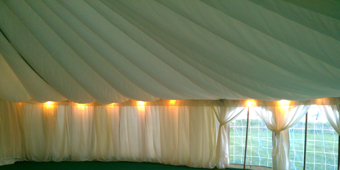 All our marquees are 100% canvas using no PVC and very marquee is designed and crafted in-house. 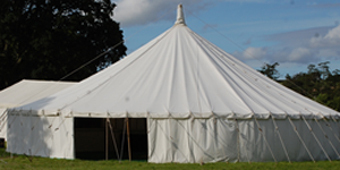 We have a traditional pole marquee size and shape to suit every occasion and venue from smaller round or oval marquees to larger square ended marquees that can extend to up to 200ft. 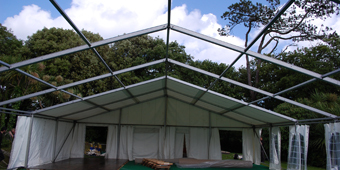 For those occasions that need that little extra interior room or where space or conditions on site are limited the clearspan marquee is the perfect choice. 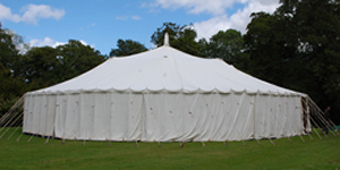 Without the need for guy ropes and poles it offers modern style that does not cost the earth, as like the traditional marquees, the clearspan marquee is hand made in canvas by Penrose craftsmen. 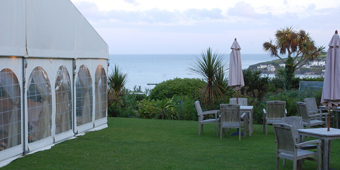 Both the traditional pole and the clearspan marquees can be provided with window walls making the best of the stunning Cornish scenery. Width 30ft or 40ft x Length 10ft to a maximum of 80ft. 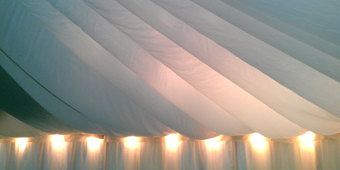 Add an extra special romantic touch to your day with a marquee lining. Hand made in Cornwall by Penrose's skilled craftsmen, linings bring that little extra touch of style and presence to your event. They are particularly suited to weddings gliding just below the ceilings and walls, adding a touch of softness to the marquee interior. We stock cream or gold linings as standard, with additional stock expected for 2013. If you have a colour scheme in mind we can also offer a wide array of coloured drapes and swags that can be colour matched to your chosen scheme. Pease contact us for our full range. 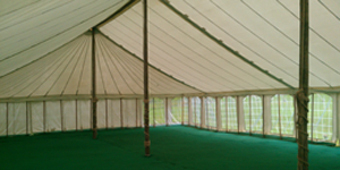 Your marquee - whether traditional or clearspan; can be sited with or without hard wooden flooring and Penrose Marquees can supply Bowling Green matting to cover the marquee floor or we can provide carpet in the colour of your choice. 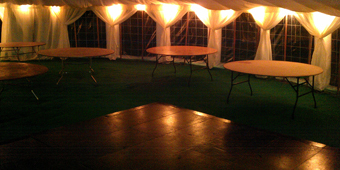 Flooring can also be extended to include a decked area beyond the main marquee. 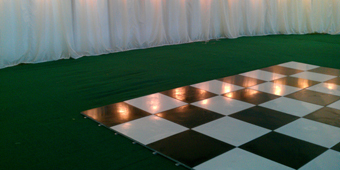 No celebration event would be complete without a dance floor and staging and a stylish dance floor can be provided along with a substantial stage capable of accommodating a significant amount of equipment and performers. A wide variety of lighting options are available from soft spot lighting to chandeliers or glitter balls. 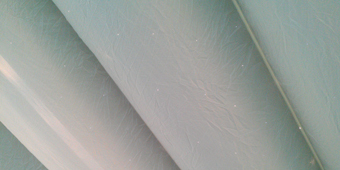 Or you could choose t have a star cloth to add a special twinkle to the dance floor for your special day. Linings are particularly enhanced by the use of subtle uplighters which lend a romantic glow to the marquee for the evenings. Please contact us for the full range of lighting that will be available for 2013. 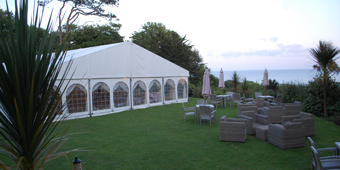 Penrose marquees can provide a fully licensed, staffed, stylish bar for any event capable of serving your guests with a wide variety of drinks.